As a Canadian citizen I’ve possessed a medical marijuana license/prescription for the past two years in Canada (where both medical and recreational marijuana is now legal), and am connected with licensed retailers of medical marijuana and CBD based products within Canada for my personal use. However, as a ‘snowbird’ residing in Mexico for half the year, it’s been a learning experience on how to best deal with the issues surrounding the legality, availability and the quality of CBD based products for me to use. This article focuses solely on the latter two items; the current availability and quality of CBD based products in Mexico that have been positioned to me via the inquiries made over the past while, along with the personal confusion from the ‘sufficiently vague’ responses. A future article will focus solely on the current legal issues in Mexico regarding the use of personal and medical marijuana/CBD products. This is NOT to say that there isn’t anything illegal going on right now in Mexico, it’s just a real hodgepodge of legal matters the new Mexican federal government is currently dealing with as a result of the October 31st Supreme Court ruling. The new federal government is working on the legislation, or a set of bills, to ultimately best govern the use of medical and personal marijuana in all the 32 Mexican states. My Canadian license is invalid in Mexico! The other means of availability is knowing someone who has personal access to it. I started my search via Google keywords and carefully crafted inquiries on social media platforms, which led to a number of responses that did nothing to add any clarity to the matter, no easier to comprehend. Yes, I know being a man means I’m not good with details, but it was a real mess! For instance, Google returned a bunch of places outside Mexico that’ll import here, claiming that it’s legal for them to export it here; (however it might not be legal to import the products!). Social media responses were a real #clusterf**k as some responders claimed they were located in Mexico but acted as the ‘middleperson’ or a distributor for the manufacturer, while others were located out of the country . They were more than happy to take my money and process the order with the manufacturer, which after much prodding on my part, I discovered could be located anywhere and the aforementioned issues surrounding customs clearance reared its ugly head. I received a plethora of responses from people that were into the MLM game, which provided absolutely no value to my quandary and in fact it only made it worse! Eventually I had to block them on all my social media platforms, and it’s disheartening how the old MLM or ‘networking business opportunity’ model has quickly permeated the CBD industry. It seems that unsavory cliques were only interested in signing me up as a distributor, and/or unable or unwilling to provide any qualitative information on the shipping of their products. It was also interesting to see on social media how many other members or representatives from these MLM organizations were being warned off by other social media groups or members due to a variety of situations. I contacted companies and representatives who responded to my inquiries that were located throughout the world, to confirm if all their CBD only products were available to be shipped to me in Mexico. I was given the standard line that it’s ‘legal for them to ship the CBD products to Mexico,’ and that they typically use couriers or via their country post office, which then is turned over to the Mexican postal service ( SEPOMEX) to complete the delivery. BUT, their disclaimer was that they cannot guarantee delivery, as once it leaves their location it’s out of their control, and it’s up to Mexican Customs authorities if the package is inspected and/or refused entry into Mexico! CBD products that contain no THC ‘should make it through,’ however products with a blend of THC might be detected by drug sniffing dogs, which puts the person ordering the product at risk and being charged with importation of a controlled substance. In the Cancun/Playa Del Carmen/Tulum corridor, there are many ‘vape stores’ that sell the equipment to use medical marijuana and CBD based products, but they disavow any access to the products, as it’s technically illegal for them to sell products. They even stated that they did NOT want any further inquiries of this nature from us! The value proposition for knowing what you’re putting in your body applies to the food you eat, the water you drink and the air you breathe, as in Mexico we drink bottled water, we bring our own ice to the beach for drinks, and wash our fruit and vegetables before eating or cooking them, plus we’re careful about when and where we go outside, as my wife and I have asthma, so clear days rule! The same logic and care must be applied to the CBD products, as the last thing you need is a life threatening allergic reaction to an unknown or unlisted additive in the CBD product/edible you’re using. In Canada, I’m interviewed by a physician who confirms if I’m allergic to any drugs or substances, and engages me with providers that produce and sell the right products. I know what the blends or mixes of CBD based products are safe for me and able to select CBD only or a ratio of THC/CBD that best meets my needs and won’t get me an ambulance ride to the hospital or worse a mortuary gurney (although my wife knows my life insurance policy is paid up and in good standing!). The same care is needed when procuring medical marijuana and/or CBD products from an unknown source, as one has to ask the hard questions about the content of the specific product to confirm its safety. From my short experience with ‘distributors,’ ‘independent retailers,’ or ‘referral agents’ they are ill equipped to answer the questions, and/or gloss over it to make a sale. I’m sure many of the readers have not had an unpleasant experience and that’s great! But it’s critical to know what the CBD products contain so it actually helps your condition, not inflame it or create a new set of medical grief! It’s always a good practice to operate under the premise CBD/THC blend is in the product, as no product is 100% CBD or THC free, there’ll always be minute percentages or trace amounts of THC in CBD products, it’s just basic hemp plant botany, no matter how rigorous the straining process! If you are employed by a company that has random drug tests and you’re taking ‘CBD only’ products, please remember there’ll be a trace amount of THC in your system. Many manufacturers are now listing a ‘range’ of CBD/THC percentages in their product blends, which is a diversion from the hard coded ranges that have been the historical benchmark. So may the buyer beware! Again, these issues were not adequately explained by many of the reps I communicated with on social media; their reply was that it was ‘all natural’ …which means NOTHING! 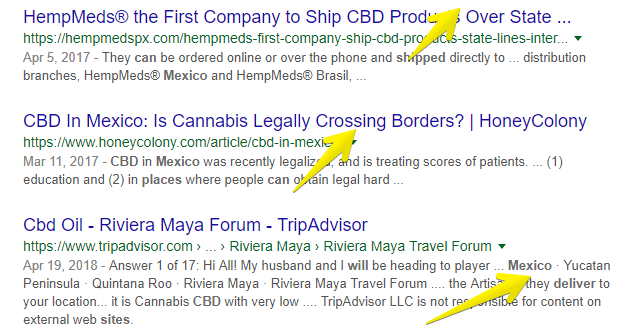 I know the article sounds negative or similar to an insurance agent selling you a policy, however for those CBD users planning a vacation, a longer stay or have just arrived in Mexico, please understand there’s a huge legal vacuum right now. It’s the wild west and until the new laws & associated standards come into effect, it’s up to the individual to do their homework, ask the right questions and ensure that what they’re putting into their system will actually help them, and not cause more grief. The last thing one needs is to return home in a box or cremation urn! Furthermore, I do not know what rules apply/do not apply to licensed medical marijuana/CBD based products for clients from jurisdictions outside of Canada, so I’m unable to speak with any legal authority to any agreements in process, or any agreements with a current standing that may exist between your particular country and Mexico. Please verify with the consulate or embassy staff from your particular country for a qualified explanation. I look forward to your emails, letters and tweets! C.J. is a Canadian baby-boomer aged comedian, who does not do winters, enjoys playing tennis, laying on the beach soaking up the sun, and watching the world go by. C. J has been using CBD based products for managing his aches and pains for over two years. I must say this is a very detailed work/article you’ve written but I must also confess that this is the first time I’ll be seeing anything such as CBD, I’ve heard about marijuana products but then no idea about CBD, can you please tell me about CBD, I’ll love to know. Moreover, I come from a place where marijuana or any related products are illegal. Thank you for your interest. Where is your home? CBD (Cannabidiol), simply put, is one of the 150+ naturally occurring phytocannabinoids (cannabinoids) found in certain strains of hemp and in all cannabis plant strains. If you would like to learn more about CBD, please check out my website at iscbdforme.org. Great information about where to purchase CBD legally. I don’t actually know why someone would need to buy from Mexico, when it is readily available in the US in many states legally. Plus, quality control in the US is better, as is Canada I am sure. And, there are now a ton of CBD suppliers online here in the US and in Canada. I think I will stick with those and not worry about Mexico. Thanks Charles for stopping by. While I agree that one must be careful when in another country, it is a given that a lot of older people are living outside of Canada and the United States and want their quality of health care to continue. Fortunately for Canadians, the law is quite clear but this is not the case in so many other parts of the world. I think it is a very good idea to leave it at home. I know some people do travel with the oil and don’t worry about it but why take the chance. I understand where you are coming from as my husband and I both use it to manage our pain in Canada and the management of it here definitely is lacking for both of us. You are also correct about the ingredients. What I have found is that no one is able to give the ratio of THC compared to CBD and we are not interested in the THC part of it at all. I read your article with interest even though I don’t use medical marijuana or profess to know a lot about it. Based in Australia my understanding is that while it is legal, not just anyone is entitled to get it and to obtain it you have undergo a rigorous assessment.Patients need a letter from their GP, as well as an importation permit from the Therapeutic Goods Administration of Australia. I understand why these controls are in place but it seems to me that for people who desperately need it for medical reasons, there is an inordinate amount of paperwork involved. It certainly doesn’t sound that easy to obtain. I think the other problem simply has to do with education of the brainwashed masses. Even a lot of GPs seem to feel uncomfortable prescribing it from what I have been told. No doubt changing perceptions, opinions and streamlining processes to make it easier for those who need it will take time and in some parts of the world it will definitely be easier than in others. Thanks for stopping by. I have heard the rules are pretty tough in Australia. For something to work effectively, everyone has to agree. It is true that some doctors are reluctant to prescribe medical cbd and marijuana. My husband and I were both faced with this difficulty. Our doctor is old school and would not even refer us to someone else so we had to go searching on our own. I too believe education is key. Interesting article on CBD in Mexico! I don’t live in Mexico but it is always interesting to find out how other countries do these kinds of things. In Australia, it is available but supposedly very hard to get a script for and it is very expensive. You also need a very good reason for the use of CBD. I think it should be available for all to use if you have chronic pain or in a palliative state and there is no relief via normal methods. I guess Mexico doesn’t want non-Mexicans purchasing medical marijuana in Mexico they want it to be licensed in your country. I would just stick to your own rules in your country regarding these matters. Hope all goes well in the future! I think if it stays expensive people will just go to the black market anyway for CBD and then no one wins. It is interesting to know what other countries do and not do when it comes to something as controversial as CBD and Marijuana, especially from the medical aspect. It is also good for expats to know the rules because so many of our seniors are living in other countries and are tired of paying for traditional drugs and the side effects associated with them. We are lucky in Canada that our rules are well defined and you know where you stand.